The Football Association has confirmed that this year's FA Cup final will take place at Cardiff's Millennium Stadium. The FA took the decision after the company building the new Wembley was unable to give "100% certainty" that the stadium would be ready by 13 May. "We are not prepared to compromise or take any risk on this," said FA chief executive Brian Barwick in a statement. 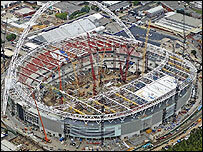 Wembley constructor Multiplex had earlier said it was "disappointed" by the FA's decision. However, Multiplex secretary Mark Wilson added: "Multiplex continues to work towards targeting completion of Wembley at the earliest possible date." The decision was taken after Barwick visited the new stadium's site on Monday with Wembley chief executive Michael Cunnah before meeting Multiplex's UK managing director Martin Tidd. The FA has also moved England's World Cup warm-up matches against Hungary on 30 May and Jamaica on 3 June to Old Trafford and the Football League has confirmed that its end-of-season play-off finals will now take place in Cardiff. Barwick continued: "We felt it was important to clarify the situation for everyone connected with the game in this country, especially for those teams and supporters still in the FA Cup. "Multiplex and Wembley National Stadium Ltd (WNSL) remain committed to delivering the stadium at the earliest possible date. "I would like to emphasise that WNSL have a fixed-price contract with Multiplex and the total construction cost remains at £757m. "We should remember that, when finished, Wembley will be world class. The stadium will host many Cup finals and England internationals for decades to come." Barwick did not give a completion date for the stadium but the first sporting event to be held there may now be the FA Community Shield on 13 August. WSNL, the FA-owned company which will run Wembley, was also unable to say when the stadium would open. Chief executive officer Michael Cunnah said: "Obviously I am as disappointed by this news as the fans who have been looking forward to coming to the first events at Wembley. "It is still too early to say exactly when the stadium will open. We will announce a definitive date once we have more certainty on when the stadium will be fully ready and finished to world-class specification." Millennium Stadium officials say they are already prepared to host the FA Cup final. "We've had a long-standing plan in place and I think it was a prudent measure on behalf of the FA back last August," chief executive Paul Sergeant told BBC Radio Five Live. "I know they took a lot of stick for it then but it has come to fruition so it was the right thing to do - and things have been in place since then." The original completion date for the stadium had been autumn 2005, with the deadline first extended to the end of January and then the end of March. Multiplex warned in January that there was only a 70% chance of the 90,000-seat stadium being ready to stage the FA Cup final. It said then that it could not afford any further delays if it was to meet the delayed 31 March deadline to hand the project to the FA. The firm issued six profit warnings between February and December last year, largely due to cost increases of the project, causing its shares to drop 42% in 2005.